I will discuss a bit of facts about the rise of the spread offense including its various pass and run elements (heavily abridged, each individual chain has its own history), and argue that it has morphed from an equalizing offense, one used by less talented programs to level the playing field, to one that merely amplifies the latent talent, so talented teams can expose mismatched defenders but there are now fewer opportunities for less talented teams and the spread may not be well situated for these "up-and-coming" programs now that it is so popular. At the lower levels it will remain and can continue to thrive where it is well coached as a tool to highlight talented athletes, particularly as more and more good athletes grow up throwing the football and becoming effective passers. The Pros are likely to never catch on to "the zone read" and such plays, just as the traditional option is not widespread in the pros either. Last, the days of the spread as "the next big thing" are over. It is the classic case that when the public at large realizes what's going on and every TV commentator is discussing how innovative you are, you are no longer innovative and someone new is soon to be annointed the next "genius." As an astute commentator pointed out, all four of the BCS bowl winners ran some version (actually a very similar version) of the spread offense. I am not sure if Texas once lined up with two backs in the backfield (not counting Vince Young!). All but Penn St rushed for significantly more than 200 yards in those spread sets, and few would argue that Penn St is not a physical team and they might have been the least spread of all the winners. Of the other teams in the BCS, Pro-Style offensive teams like USC and Notre Dame ran lots of "spread stuff," and in ND's case I think it actually hurt them since their offensive line had difficulty pass protecting. The zone read was on full display throughout the bowl season. In the West Virginia-Georgia game the TV ran some great shots of the play and explained well who is being read and the idea behind the play. They obviously had lots of examples of great blocking and running to make a believer of nearly anyone. 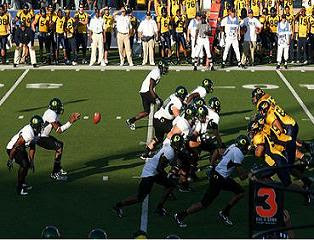 Of course that game featured innovator and Johnny Appleseed of the spread-run game Rich Rodriguez (Tulane, Clemson, and WVU, who spread his knowledge first hand to teams like Northwestern and others who themselves have propogated the offense), but the BCS title game was the crescendo, with a quarterback dependent offense run by maybe its best triggerman ever. Vince Young's performance is well chronicled, with 30 completions in 40 pass attempts (with virtually zero yards after the catch for Texas's receivers) and 200 yards rushing. Last year Alex Smith became the number one pick as a run-pass threat under now-Florida Coach Urban Meyer, who himself won his first bowl-game at Florida. Meyer is considered one of the "gurus" of the spread-O, yet he was a relative neophyte to the offense before going to Bowling Green in 2001, when he studyied and adapted some of the Northwestern and Rodriguez run schemes along with the Louisville Cardinals passing game when John L. Smith (now Michigan St HC), Bobby Petrino (Louisville HC) and Scott Linehan (Miami Dolphins OC) were coaching there. The offense's rise has been meteoric. I was inundated with questions and articles on Urban Meyer's O and the spread option game were always some of the most trafficked ones on the blog. Next season the schemes will be even more prevalent, especially at the HS level. But where next? Eventually all offenses are tested in the NFL. The final verdict on any scheme or philosophy is eventually tested, chewed up, synthesized, and sent back under the 24 hour/365 day scrutiny that is professional football. Time, money, technology, and the best football minds always level a verdict. Other offenses can survive at lower levels (and often can be more successful than what the Pros themselves do with their more sophisticated passing games and less success of deception based offenses like the Wing-T), but the book will be written at the pro level, or at least adapted by it. The Run and shoot had its weaknesses exposed (primarily the zone blitz) but it also had its best aspects co-opted by nearly every offense. Its mark is real, if subtle. Further, the "spread" is not so different than what the Pros currently do. Watch Texas Tech and they will run the "mesh" six ways from Sunday. Watch the Colts, and they will run it a bunch too. The big question then becomes, what about all this spread-to-run business? The question has two answers. One, many teams already do this, as evidenced by how many teams are one-back oriented. Watch the top running teams in the NFL: the Chiefs, Broncos, and the like, and they will spread to run a good percentage of the time. Even the Redskins, a power team, like to use lots of motion and multi-receiver sets to get the D thinking pass before using H-backs to kick out, pull, or lead into the hole. The second question is, what about the quarterbacks? The Falcons have been one of the best rushing teams in the NFL for the past few seasons, due in no small part to Michael Vick. They run lots of bootleg with him off of the outside zone and inside zone runs, for the same reason that Texas or West Virginia run the zone read: to get double-teams on the playside and either make the backside defensive end stay home or pay with a big QB run. Yet, the Falcons haven't gone to the zone-read. Vick has been injured at times. We see big rushing days by a Donovan McNabb or even good runs by a Jake Plummer, but where are the 100 yard rushing days we have seen from Vince Young, Troy Smith, or even guys like Alex Smith or Northwestern's old QB Zak Kustok? First, the common argument against this is the team speed of the NFL defenses. The spread works best when you have great one-on-one matchups. Texas and Ohio St. are so dangerous because they force you to "pick your poison" and leave one-on-one either the receivers, RBs, or the QB. USC played at least one and mostly two safeties deep nearly the whole game. When Pete Carroll did blitz he often brought zone blitzes--surprisingly afraid of getting beat deep by the outside receivers of Texas. Consequently Young picked them apart but also ran the ball so well. The argument is at the pros the speed of the defense can nullify some of this. The Pro safeties can defend the deep ball and stick your QB for no gain. I think the better argument though is simply the nature of the league. The problem isn't only that those safeties can range the whole field, it is that when they hit your QB they send him to the hospital. The NFL already can't keep their signal callers healthy for a whole season: McNabb and Vick have both constantly battled injuries, but so have far less mobile QBs like Chad Pennington, Rex Grossman, Culpepper, etc. Can you imagine the Colts, with Peyton Manning--all $50 million+ of him--running a QB run of any kind with that much at risk? No first down is worth losing your franchise. The harsh fact is that financially, Vince Young costs the school just as much as his backup: one scholarship. Even more, Peyton Manning, Brady, McNabb, these guys are your team for 10+ years. At most you get four years from a college QB. More likely you get two seasons. The "spread" may actually make Vince Young's decision to go to the Pros for him. Were he to return, could he request that the coaches not run him as much, to reduce his likelihood of injury? Keep another guy in to protect him more so he doesn't take as many shots? The spread has always given up shots to its QBs; the good ones just get the ball out first. At the Pro level these risks are unacceptable, with fan-bases, cap room, and playoff hopes all riding on their signal caller. Certainly next year it will be everywhere. The big issue though is what do the small teams do now? It used to be that you could "get good" by being a spread team. In just the last four years Urban Meyer resuscitated two programs and cashed in at Florida, in no small part by being a "spread guy." When Ohio St and Texas are running the same offense as you and scoring 50 points, how can you sell yourself as being "different" and "wide open"? Being spread is simply no longer enough. Some of the most inept offensive performances I've seen this year were by "spread teams." I watched Oregon get dismantled with their spread O in the bowl game, as they went 5-wides a majority of the time. This is an unwise move when the defense has five covermen who can cover your receivers man to man and when their front 4 or 5 can break a guy free vs. your OL nearly everytime. They had far more success and were less predictable when they added TEs and RBs and used more misdirection and/or power. Their OC is Gary Crowton, another spread guru from the Louisiana Tech days who had a mediocre Pro stint and an up-and-down campaign at BYU. Purdue this year, a staple of spread offenses and hero who went from perpetual loser to Rose Bowls and Big 10 contention, continued their downward offensive spiral, as their defense, which had continued to prop them up over the past few years collapsed as well. Purdue over the past few seasons has run into the same problem Oregon had. In the beginning, when they started spreading four and five wides even Michigan or Ohio St did not have five good covermen. Now even Minnesota, Iowa, Wisconsin and the like all have 6 or 7 good ones. Result? Lots of 3 and 4 yard passes and even more plays with five receivers out and zero open. The offense has arguably become the opposite of an equalizer, it has become an amplifier: if you are talented you can really rack up the points because no one can cover Vince Young, Ted Ginn or the like one-on-one, but if you're not, you just get sacked and no one gets open. Purdue even tried to add the spread option stuff this year but an offensive line that could not get movement and a lack of playmakers stunted the offense's production. It's harder to predict where this will go, as I can guarentee 20 years from now there are going to be some "true spread teams" and "spread run teams" lingering just as there are successful double-wing, wing-t, run and shoot, and splitback veer teams. Well coached and coordinated offenses will continue to be successful. I also think that putting your best player at the "Vince Young QB" spot is a great way to win football games. The days of having an I-back and just feeding your best guy carries and having a statue at QB who throws 5 passes a game is (mercifully!) about over. Why is that? This is a whole other discussion, but the big reason I think is the proliferation of information on good quarterbacking. Instead of one or two kids who can throw a decent spiral and a couple guys around a city who know a few decent QB drills, now there are books, manuals, videos etc for parents, kids, coaches alike. Lots of kids, from inner-city to suburban can learn the fundamentals of quarterbacking. There is no reason that "athletes" can't throw the ball, at least well enough for HS. There might be issues that arise later in College or the Pros with complex coverages, but if I had a 4.5 guy who could throw a bit running my offense, I guarentee you I can win some games. Further, the "spread" and the "zone read" do force the defense to account for all 11 men. The safeties must step up for the QB, as he is another threat, thus putting either your RB running against reduced fronts, or receivers one-on-one. This is logical and good football. Again though, as teams get better at defending it, can the team with 19 kids on varsity run this as an equalizer? Uncertain. It is unlikely to help as much as maybe it has in the past. This was meant as a brief overview. The "spread" can be many different things, but it is not so new. This is probably why it is both so effective and why its rise (and predicted decline) has been so fast. The big issues are that no longer can I be "different" from the other teams in my conference or in the state by being a spread guy. Second, teams see it more and can defend better. It still is a great way to highlight great players, and, being so QB intensive, a great player can be extremely effective, particularly at the lower levels. At the Pros, too much money and the risk of injuries appear too great to put total emphasis on the QB, as there already exists so much. Great players may come along though and prove me wrong, but Walter Peyton with a cannon running QB for a team, even if he wins a title, may or may not disprove my theory.